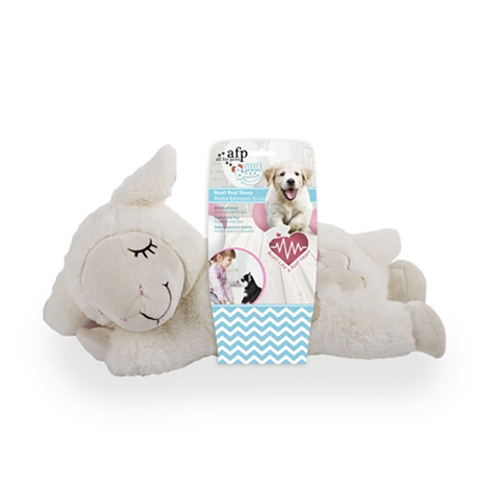 The Heart Beat Sheep from All For Paws is a soft cuddly toy that can help young puppies and kittens. The sheep creates the intimacy of the mother through a beating heart. Lifelike heartbeat: The sheep has a heartbeat that your puppy can hear and feel, and the calm tempo has a soothing effect on your puppy or kitten. You can activate the sound by pressing a button in the tummy. The beating heart can then be heard and felt for 20 minutes. Familiar scent of the nest: In order to properly prepare for the arrival of your new puppy or kittens, the soft toy can be placed in the puppy or kitten's nest before the move. This gives the sheep a familiar scent that the puppy or kitten associates with the nest, and will help the puppy get used to his new home when he moves. Have you used AFP Little Buddy - Heart Beat Sheep before? Let us know what you think about this product. First product went missing in the post, however this issue was dealt with swiftly by customer services. Was sent as a gift to a family member with a new kitten. Have been told the kitten took to it instantly and loves it! Thank you!